A couple months ago, we wrote about just what constitutes a Scout campout. Scout camping, as you’re aware, is different from ordinary-folks camping because it aims to fulfill a purpose besides recreation and just getting outside. Scout camping is where the values of Scouting come to life and is the end result of a month’s worth of planning and preparation by our Scouts. Does the activity achieve the aims of Scouting? Does it result in opportunities for personal growth – physically, mentally and spiritually? Does the activity encourage the development and the strengthening of the patrol system? Do patrols plan their own participation, camp and cook separately? Are patrols generally independently self-sufficient while on the campout, even though they may be participating in interpatrol activities or competitions? Is the activity something that the Scouts make happen for themselves? Did the Scouts plan and prepare for the activity or is it a pre-planned, “canned” event that is presented to the Scouts? The first element is pretty much a given as it’s present in most of the things a troop would do, so the real test is usually in the second or third elements. The patrol method element fails if, say, the troop plans a single activity and everyone sleeps together in a cabin (or even in hotels, in the question Clarke answered). Another example would be where Scouts don’t tent by patrol, or just pitch their tents randomly intermixed, and a handful of Scouts (or -shudder- the adults) cook for everyone. The self-determination element fails if someone (whether Scout or adult) plans a group activity, such as a ski trip, caving excursion or museum tour. If it’s something that’s planned for them and they merely participate – as I mentioned earlier, “buy a ticket and stand in line” – it probably doesn’t qualify as an appropriate Scouting activity. 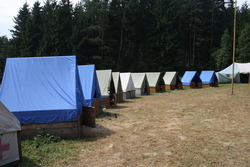 Even when tied in with overnight patrol camping, such activities would fail the third test. You might wonder about camporees, where many troops come together for inter-troop or inter-patrol activities. Are these not canned events that are planned and presented? In a way, they are, but Scout camporees generally have activities that are carefully designed to advance the methods of Scouting and involve patrols (rather than troops) as the participatory units. Patrol camping is almost always possible – even in small campsites, patrols can still group their tents together and manage their own affairs independently of other patrols in the troop. There’s nothing that says a troop can’t occasionally do these fun activities that, for the Scouts, are no-brainers. In fact, boys being boys, they’d welcome the opportunity for someone else to plan their fun for them and just go along for the ride. But the vast majority of your monthly outings should clearly pass the three tests, or the Scouts aren’t getting the Scouting they deserve and expect.